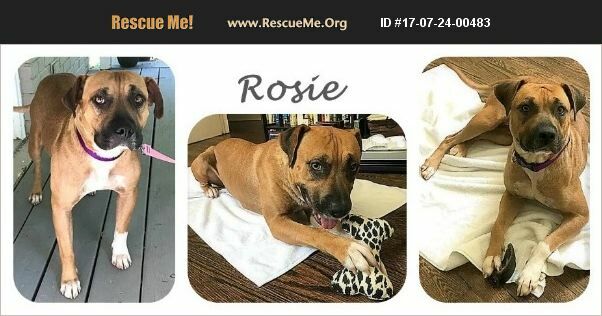 I'm ROSIE a love-bug of a Boxer mix who's 1.5 years old and weighs about 54 lbs. I'm a little shy at first, but then I warm up and I'm super sweet and calm. (I'm pretty chillax.) I can play quietly by myself and if you're working, I'll just put my head in your lap to see what you're doing. (Can I help?) I could live with a submissive dog and I'm playful when I want to be. (Throw me a toy!) If you like that special Boxer personality, you'll love me. Plus, who could resist my pretty eyes? I'm ROSIE! Come get me soon! ROSIE is spayed, heartworm negative and up to date on age appropriate vaccines. Adoption fee is $325. Please note that training is highly recommended for all young dogs. As with all rescue animals, breed determination cannot be validated without genetic testing. Visit WWW.LULUSRESCUE.ORG and click on the ADOPT tab for an overview of Lulu's Rescue adoption process. Thanks for adopting and saving a life -- you are ROSIE'S hero!